Did you know there isn’t a single article, video, or part of BigSkyRise that I feel is perfect? In fact, I posted this article even though I think there’s a lot of room for improvement. For example, I’m not particularly satisfied with this introduction, the middle isn’t so great, and neither is the end. Nor, do I feel like I successfully weaved in a quality narrative to pull you through this post with a high level of interest and information absorption. Why did I post this? Why am I telling you that I feel this post is very far from perfect? Well, the answers to both questions share the same root. This root is comprised of a mindset and approach that’s greatly impacted my own life, and one which I’m sure can be very beneficial for you too. Do you ever have the tendency to be a perfectionist? Do you get frustrated when things don’t turn out exactly how you’d like? Are you ever prone to procrastination? Do you ever feel stuck and like you aren’t advancing? Do you ever tend to do the minimal amount necessary to get something done, rarely improving on your past? Have you been referred to as a slacker, or someone not living up to your potential? Do you have a desire to make some change, yet keep putting it off for “someday” in the future? There’s a simple way to be more productive and get more done towards whatever you are aiming for. Amazingly enough, I am telling you that simple way exists, and it’s available to you. It’s also the thing that has greatly impacted my own life, and is behind the two “Why?” questions above. All it takes to increase your productivity and level of accomplishment is a simple reorientation of your own perspective, a shifting of your mindset and approach. So, what’s this mindset shift and change in approach that I’m talking about? What it boils down to is a simple refocusing onto progress, instead of perfection. For many of us, even if you may not consider yourself a perfectionist, we tend to consciously and unconsciously hold ourselves back when a perfect outcome isn’t happening or seems unlikely. The thing is, that while perfection is something much sought and heavily promoted in much of today’s society, it is also something that doesn’t really exist, at least in the conventional sense of the term. Much like how there isn’t, and yet is, a perfect moment to start something, being perfect and producing perfection is unachievable and also always inherently accomplished. The perfection we seek, is like a mirage that shifts and changes. This change comes in part because the perfection as we conventionally define it is really just an opinion — and opinions change frequently, especially since they are based off the vantage point of a limited perspective. Taking creative works as an example, even if we reach a point where we craft our “perfect creation”, as time passes, our perspectives shift, and that perfection is lost. The thing we thought we made perfect, no longer feels so perfect. Among other things, it is this unachievable aspect of conventional perfection which causes us problems. Or, viewed another way, it is our desire for, and expectation of, unattainable perfection which causes us problems. So, if perfection is unachievable, and expecting it is a source of problems, how do we deal with it, especially if we have conscious or unconscious perfectionist tendencies? To reorient your mindset to be one that works towards progress instead of perfection there are a number of helpful steps. Explore the downsides of perfection and the plusses progress provides. Look to see the ways you’ve already made progress in your life. 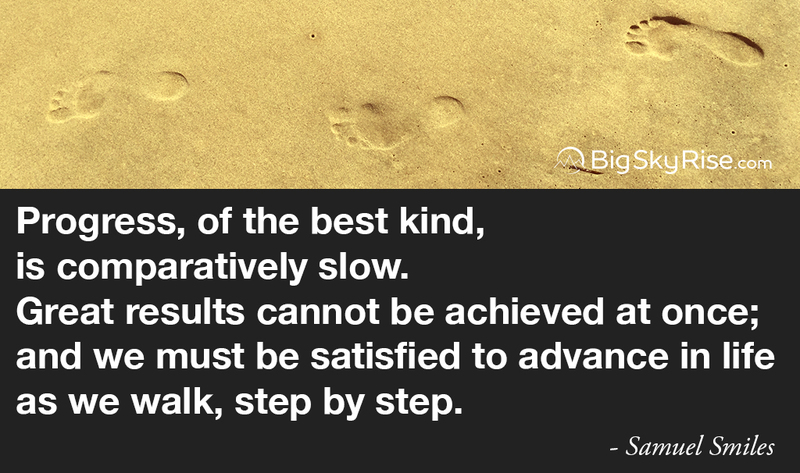 Ask yourself how you can make progress towards your bigger objective. Be aware of the larger goal while concentrating on the step you need to take now. Share whatever you’re working on before you’re “Ready”. There are many problems associated with seeking perfection, and at the same time, there are many positives to simply working towards progress. While certainly not comprehensive, below is a breakdown of some of the major points. Whether you read these all now or not, this list is a useful one to return to in times where perfectionism begins to creep into your mindset. It prevents you from starting since your task can feel overwhelming. You get caught up in minutiae that prevents you from seeing the bigger picture. You prevent yourself from moving on to new pursuits and perspectives where you can learn and grow beyond what you previously considered perfection. Much of the time, you won’t get anywhere. Pursuing perfection and inevitably not reaching it leads to discontent, a loss of confidence, unhappiness, and a reduced level of confidence. You hold back good things and positive contributions from the world when they are sorely needed now. Seeking perfection makes you too rigid and unable to adapt. Your perspective and energy is negative, you’re usually looking at how you failed, messed up, didn’t do well enough, and so on. Your focus is on worries. Failure to accomplish perfection is usually seen internally as just failure, and important lessons are missed. When you focus on what’s wrong you miss new opportunities for something right. Forgiveness is difficult when perfection is expected. When seeking to make big changes, seeking perfection is unsustainable. When we only try to accomplish perfection we work under the mistaken assumption that we have all the knowledge, experience, and perspective necessary to know what perfection is. It’s easier to start since even the smallest step can be seen as progress. You can see a bigger picture easier. You can move on or step away to take on other pursuits easier, allowing you to revisit with new insights and perspectives. Every step gets you further. Since each step brings progress, you build confidence, momentum, a sense of accomplishment, and more motivation to go further. You share good and useful things and positive contributions with the world faster, so they can be utilized sooner and to a greater extent. When you share things out, it gives you a fresh perspective, motivation, important feedback and insights into things you may not have seen yourself. It’s easier to be adaptable, flexible, and open to new ideas and directions. Your perspective is positive. At the very least, you’re looking at the progress you’ve made, the progress you can make, and the opportunities that are there. Your focus is on solutions. There’s less stress, positive small steps and accomplishments mean more, and missteps mean less. Making a misstep, or failure to take a progressive step, is easier to see as a learning opportunity and thus a progressive step in its own way. There’s less fear, so you stay more in the prefrontal cortex, meaning higher level thinking is easier to do. You’re more open to new opportunities, to moving on to something that might be more important, powerful, interesting, useful, and so on. Forgiveness for mistakes is easier. The long term results are better. It gives you a perspective which affords you greater patience when the journey is taking longer than anticipated. Consistent progress allows you to go beyond the limitations of the “perfection” that you may have previously considered. We’re more powerful and capable than we think we are, so when we keep making progress, we can move beyond our own self-limitations. It’s easier to redirect energy and focus into things that matter more, that are more important, and that have a greater impact. There is beauty and perfection in imperfection. Focusing on progress recognizes and allows for that, even in situations where we can’t view that perfection ourselves. This approach allows for satisfaction and contentment with what is, even while working to change things for better. When you seek progress, you look at ways to make things better instead of perfect. Often when we seek “perfection’ we see only one way to do it; a way we can’t really accomplish. When we look to make things better, we see a nearly unlimited set of options available to us, and they are things that are achievable. Additionally, we can also choose when options are of interest or worth the effort to us. Working towards progress makes it easier to bring yourself into the present moment, to be in it, and focusing on the step you are making now. Ultimately, being fully in the now is a major part of being on a path of happiness and fulfillment, so this is quite important. While in general, it is better to remain in the present, done consciously and with skillful intent, observing the past can provide worthwhile lessons for the present. Reminding yourself of the progress you’ve made in the past offers benefits applicable to the present, in that it can open up perspectives and awareness of things which otherwise might be missed. That is why it is a worthwhile exercise in this case. Additionally, these benefits are applicable across the board, regardless of the type of endeavor you are undertaking, be it general self-development, learning a new skill or concept, dropping fat and getting fit, or simply trying to overcome some form of obstacle. Reminds you that you’re more capable than you may give yourself credit for. Helps you remember that things you may have viewed as perfection in the past are no longer viewed as perfection. This in turn reinforces the point that perfection in the conventional sense is an illusion, thus reminding you that there’s no point in pursuing it. Gives you perspective so you can more easily see that you’ve been on a long journey, and even with all the stumbles, tough times, setbacks, obstacles that seemed like they couldn’t be overcome, and things that didn’t seem to turn out exactly how you’d wished, you’re still here, still trying, still breathing, and that is what matters. Provides a vantage point where you can see steps that may be applicable for making progress from this point on. Offers a reminder that sometimes progress takes time and patience, and that is okay. The usefulness of this question comes in part from the way in which it helps you point your focus in a positive direction. By asking it, you begin to look at what is possible, what options exist, and what you can do, as opposed to what isn’t possible, and what you aren’t able to do. Your mind opens, and greater possibilities and opportunities present themselves. Additionally, in asking this you focus on your goal and actionable steps that will move you towards it. Often when focusing on perfection, the illusion of the perfect end goal preoccupies us enough that we struggle to know a worthwhile next move while also not enjoying the current place we are at. Being aware of your larger goal orients you so that you are headed in the correct direction, and know the overall picture. By keeping the main focus on the step you need to take now instead of the perfect end outcome, you ensure greater progress while also putting a greater percent of attention on the task at hand, which is really the only part you have any ability to work with at the moment. In other words, this allows you to be aware enough of potential long term outcomes that you make steps which lead you where you really want to go, while allowing you to devote your energy, focus, resources, and attention on the here and now and the elements you can impact. Additionally, placing your focus on the step at hand means you will do a better job with the step you are taking. When you are distracted, diverting energy into different places, and concerned about things other than the immediate item you are working on, you’re more prone to make mistakes, miss opportunities, and trip up in some form. Sharing whatever you’re working on before you’re ready can take many forms, and the manner in which you do it really comes down to the exact nature of what you’re working on. In the same way, knowing precisely when to share can be a bit tricky, especially when getting accustomed to this approach. The basic guideline is simply: find some way to share while you’re still uncomfortable doing it. While it can be a bit uncomfortable, especially at first, there are countless benefits to sharing before you’re really ready. Your perspective changes in a variety of positive ways when you share something out. To illustrate, take this very site. Obviously, I want to share the best I can. That meant prior to launching the site, there was a strong pull from the trap of perfectionism. As I built the site, I kept trying different themes, designs, and looks. I also kept playing with different ways to message the same information, and I kept second guessing decisions I’d thought I’d settled on earlier. The thought of “How can I make this perfect for when I launch?” kept creeping insidiously into my mind. Along with that thought came an inclination toward impossible expectations. These expectations existed in the idea of creating a perfect site with perfect clarity in messaging, and in thinking that a perfect site would mean instant success in reaching multitudes of people through the magic of awesomeness. As these thoughts began to appear, thanks to previous mindfulness practice, I was able to recognize them and what they meant. So, I reminded myself of this principle of progress over perfection and of sharing before really being ready. I also reminded myself that there are great benefits to getting something up and out, and working to improve it from there instead of keeping it offline and hidden away. In terms of benefits to you and others, sharing the site and content early gets information out to you, where it can be useful, even if it isn’t in the greatest of states. Perhaps, right now there is something you can discover on the site that clicks just right with where you are in life. That discovery might impact you and your life in a small or large way. However, if that information were still locked away because I am worried about the color of the buttons on the site, or the poetic quality of my words, it would be a big loss for everyone. In the same way, perhaps there is information on this site that will help someone you know. With the site live and online you are able to share it, whereas otherwise you would not be able to. The person or people you share it with can benefit as a result. Additionally, by putting this out live to you and others earlier rather than later, you now have a chance to influence the content, design and development of BigSkyRise. Alternatively, if I held the site back for “perfection”, by the time it went live — if it ever did — much of what would be there would already be set. That would mean that the site would actually be less perfect for you since it wouldn’t be as tailored to your needs. As a result, by sharing this early, you and others gain the chance to access potentially helpful information early, and also get a site that is more tailored to you. Along with benefitting you, sharing the site and content before I really felt ready also brings benefits to me. In sharing the site and its content, I get greater clarity on directions to take the site and content. With the site live I can now learn what is interesting and most helpful to you. Plus, I can see elements that are more important than I originally thought, and other things that are less important than I thought. As a result of making the site live, it’s easier to see the big picture and not get lost in meaningless details, or details that are better addressed at a later point in time. At the same time, having the site live helps me grow my audience organically. In another example of something that is obvious, yet easy to forget, if I kept the site offline, there’s no way anyone would be able to read or share it. Few people are interested in visiting a blank web page or in signing up to a newsletter with no content or updates. Plus, if I approached it that way, by the time I did finally send an update, no one would remember who I really was, or why they’d signed up in the first place. With the site up and live, people have a chance to find it if they are really looking for an answer to something, and that’s important. I don’t want to hold back potentially helpful information for the sake of my own pride in crafting a “perfect” product. Along with that, when it comes down to it, there is no real clear demarcation when the site and content — or myself — are really “ready”. Given that there is no true “this is ready” point, there’d be no time that launching really felt exactly right. As time went on, the pull of perfectionism would get stronger, making it even harder to launch. (When you sit with something a long time it usually feels like it is that much more important to make it just right). As such, launching the site before I’m ready or comfortable is really a necessity. So, doing it earlier, when it can help more people makes the most sense. On top of that, when I made the site and BigSkyRise project live to the world, I also really felt the perspective shift I mentioned earlier. I quickly found myself wanting to make the site and content better, instead of perfect. I now see lots of ways to improve things that I can implement over time, and these are things I would not have spotted had I kept the site behind closed doors. All that aside, there is one benefit to sharing early that trumps all the others; I’ve already been able to help people through BigSkyRise that I otherwise would not have been able to. Since that is the ultimate goal of the site and content, that means I’ve already taken a key step on the BigSkyRise journey. Helping others is a benefit unto itself, and it comes with added bonuses as well. Seeing positive impacts provides added motivation to keep going, it builds greater confidence, and it helps provide a reminder in challenging times that BigSkyRise is both a meaningful and worthwhile endeavor. In a great many ways, life is about the moment and about the journey, more than it is about the destination. Focusing on progress instead of perfection emphasizes what you can do right now, making it easier to be in the moment and enjoy the journey more. At the same time, it's easier to accept the current state of things as they are while embracing your ability to make things better. When you aim for progress, it's easier to see that the journey is not about reaching the perfect you or perfect whatever, it's about taking the steps on your journey, and really living in each of those steps. Seeking progress makes it easier to adapt, to be flexible, and to be open to new ideas, information and directions. As a result, it’s also easier to change your mind about something in light of new evidence. Changing our minds in this manner is part of the learning process, and that leads to an additional benefit of seeking progress instead of perfection, we are more able to learn and grow. Due to the nature of pursuing progress, there’s less tendency to blindly stick to something merely out of a sense of pride, arrogance, or tunnel vision. That opens us to learning, proving ourselves wrong, and sharing what we learn even when it shows that we previously made a mistake. Recognition of errors or a lack of information coupled with an associated redirection allows us to improve ourselves and improve things for others. We can admit to mistakes easier without feeling like we’ve failed in some way, instead we can see that we’ve grown, and that the journey we are taking is part of a learning process. At the same time, our openness and active acknowledgment of these things reduces the level of difficulty for others to do the same. As a result, this opens the door to greater levels of understanding, forgiveness and compassion all around. To get more productive, better results, and a greater level of happiness among many things, make a simple mindset shift. Perfection, in the conventional sense, does not exist. Read through the above evidence, find your own evidence, and commit to understanding how seeking perfection is harmful, while focusing on progress is beneficial. Ask yourself how you can make progress, even the most minimal amount. Look to see the ways you’ve already made progress. Recognize the larger goal while concentrating on the next step. A bit of clarification… Seeking progress instead of perfection still means you do your best with whatever your doing. It can be easy to confuse doing your best with seeking perfection, which is likely one reason the ailment of perfectionism is so common. In reality, they aren’t the same thing though. Once you understand and see how working towards progress leads to better things than seeking perfection, the distinction becomes more clear. At the same time, it becomes easier to see that making progress over seeking perfection is how you actually do your best — and in truth, we are always doing the best we can — plus it is more freeing and relaxing. Ultimately, happiness and fulfillment comes from being in the moment, living in it, and accepting that what is, is. When it comes to progress, this means being fully in the step you are taking, enjoying your journey, and not attaching things like ego, expectations, or a sense of worth to the outcome of the step being taken. Know some perfectionists, or others who might benefit from practicing progress over perfection? Help others, help me, and help yourself by sharing this message and BigSkyRise.